Pic of sear chicken before I placed in slow cooker. This Asian style inspired chicken will become one of your favorites, especially after you see how easy it is to cook. In skillet heat oil over medium high heat. Season both sides of chicken with salt and pepper. Sear chicken on both sides until brown. Remove chicken to a plate. Add 2 or 3 slits in chicken. 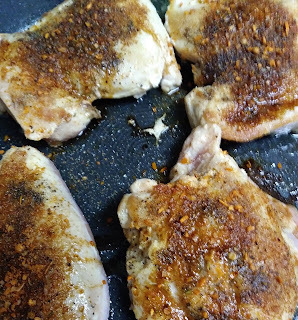 Sprinkle chicken with garlic powder, drizzle worcestershire sauce and add roasted garlic herb. Place chicken in slow cooker. Pour orange juice around chicken. Cook on low heat for 4 to 6 hours, until chicken is no longer pink. Christine, this looks like something I would really love to try! Sounds so scrumptious!! I love citrus flavors with chicken and love using thigh too! This would be so good! Its really good. Thank you! Mama used to do an orange chicken. I never learned how she did hers! It will be interesting to see if this tastes like hers. Thanks for the memories and the recipe. If you try it let me know how it turns out. Thanks! I'm always looking for good chicken thigh recipes, this sounds great! We love chicken. Thank you!